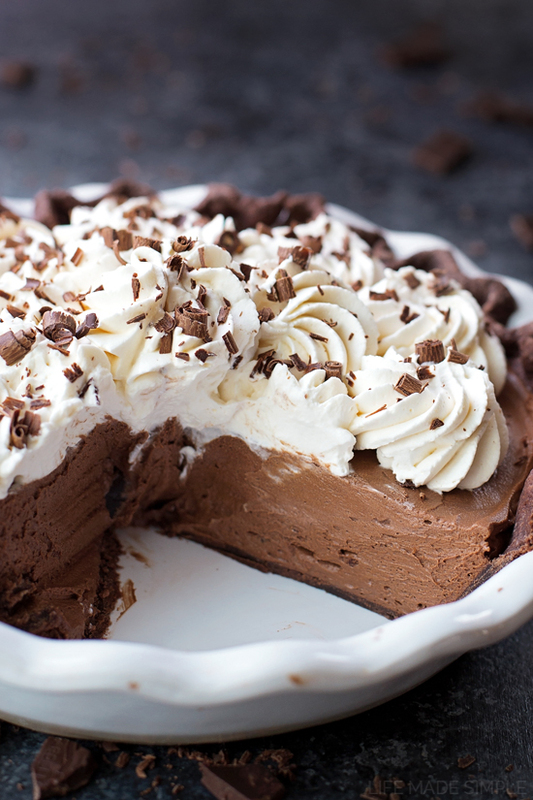 This double chocolate French silk pie is a chocolate lover’s dream. 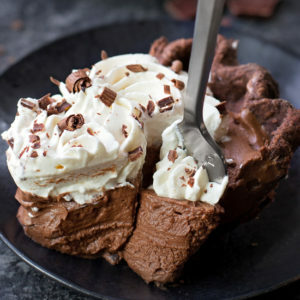 It has a chocolate pie crust, rich & silky chocolate filling, and of course, lots of freshly whipped cream! 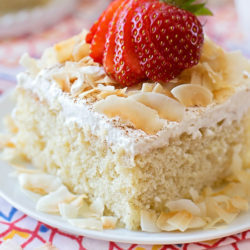 When it comes to pie, I absolutely adore fruit-filled ones, however, my husband is all about coconut, chocolate or banana cream. This fall I wanted to make him something he’d really enjoy, so chocolate it was! French silk pie can either be extremely simple or overly time consuming. This recipe is somewhere in between. 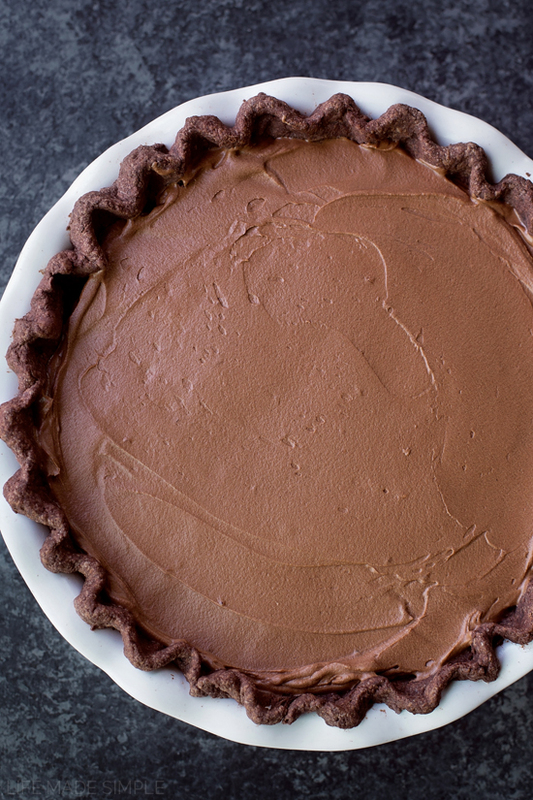 To start, you’ll make a from-scratch chocolate pie crust. I used a food processor which made the process quick & easy, however, you can do the old-fashioned pastry blender method too… either way works. Blind bake the pie crust, then let it cool completely. This will ensure that the crust stays tender and flaky. While the pie crust is cooling, you’ll want to make the filling. I grabbed some eggs, heavy cream and bittersweet chocolate from Harmons Grocery. 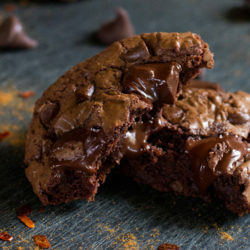 They have a great selection of baking chocolates and artisan chocolates, all of which would be ideal for this filling. Since I’m not a huge fan of raw eggs in pie (especially when kids are eating it), I decided to cook the eggs over a water bath until they reached a safe temperature of 160 degrees. It’s a bit time consuming, but definitely worth it in my opinion. Plus it creates a custard-like texture, which I loved! Mix in the melted chocolate, let it cool, then fold in the chocolate whipped cream. Spread the filling into the cooled crust and pop it into the refrigerator to set. I’d suggest giving it at least 2 hours to firm up, however, 4 is ideal. 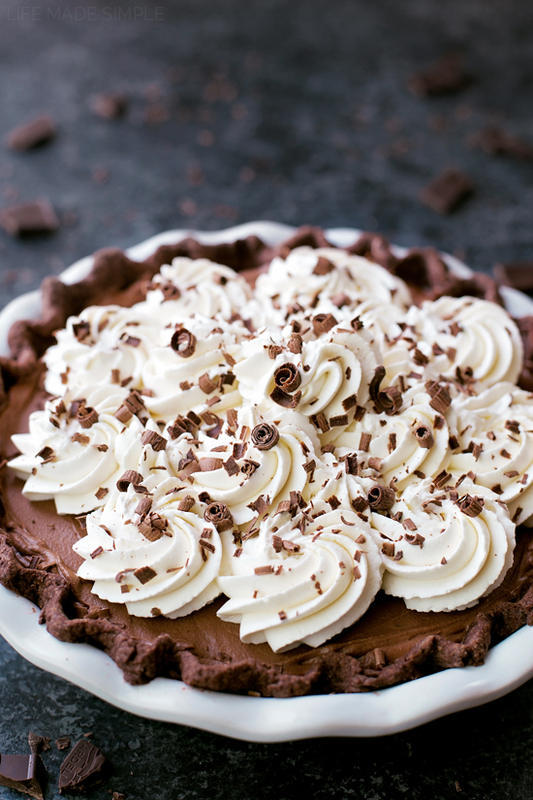 When you’re ready to serve the pie, add some freshly whipped cream to the top and sprinkle with chocolate shavings or curls. Slice it up and watch it disappear in no time! This double chocolate french silk pie is going to be a holiday tradition at our house. 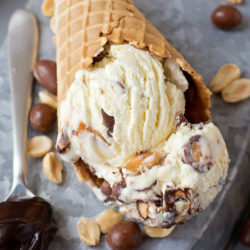 It’s rich, decadent and a huge crowd-pleaser! 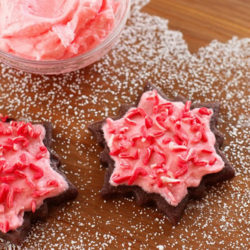 Wan’t to learn how to make amazing holiday pies? 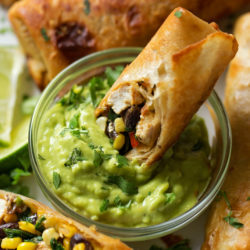 Hop on over to harmonsgrocery.com to browse their hands on culinary classes. Short on time or resources? Stop by your local Harmons Grocery and grab a freshly baked pie or cheesecake- or order them online! 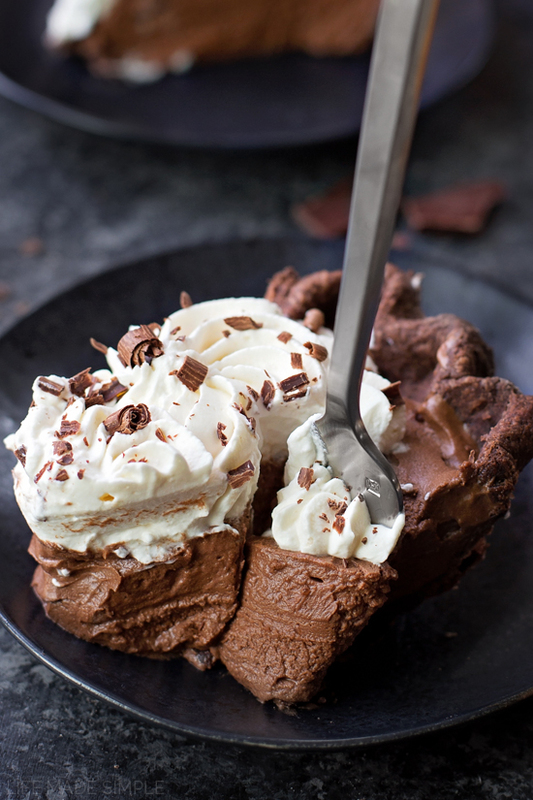 This double chocolate French silk pie is a chocolate lover's dream. 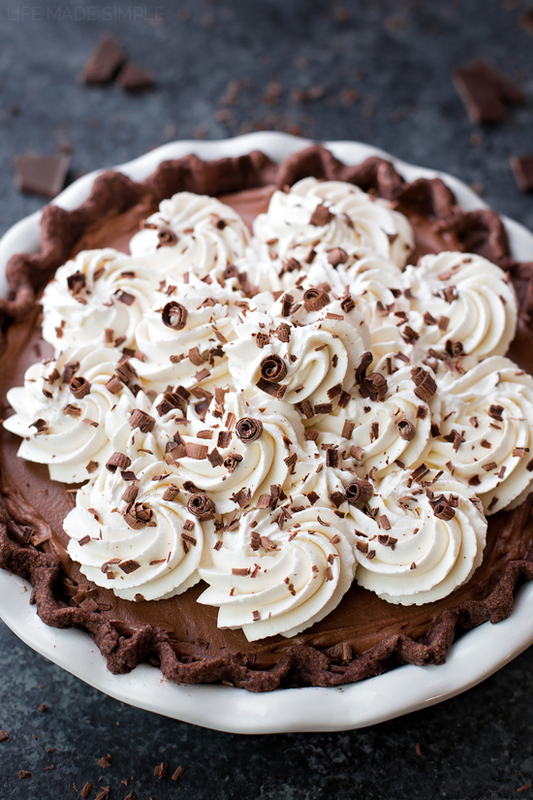 It has a chocolate pie crust, rich & silky chocolate filling, and of course, lots of freshly whipped cream! 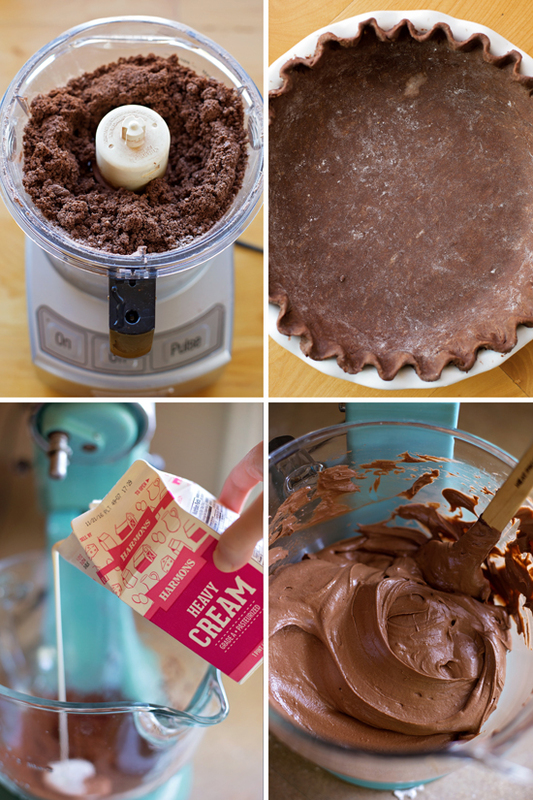 To make the crust: combine the flour, cocoa power, sugar, and salt into a food processor. Pulse until for 15 seconds then stop. Add the cubed butter and pulse until crumbs form. Add one tablespoon of water at a time, pulsing after each addition until clumps form that resemble coarse wet sand. Form into a disc on a sheet of plastic wrap, wrap and freeze for 20 minutes. On a lightly floured surface, roll the dough out evenly into a 12-inch circle. Carefully roll the dough around your rolling pin and carefully lay it over either a 9-inch pie plate. Trim the edges and leave an 1-inch overhang. Fold the overhang underneath to form a rim, then crimp with your fingertips. Line pie crust with parchment paper and fill with pie weights (dry rice or beans). Bake for 16-18 minutes, then remove the pie weights and parchment. Gently dock the bottom of the crust with a fork and return to the oven to bake for 5-10 minutes. Remove from the oven and allow to cool completely. To make the filling: double boiler or a medium heatproof bowl, beat together 4 eggs and 1 ½ cups powdered sugar until light. Set the bowl over a saucepan of simmering water and cook the mixture, whisking constantly, until thick (and until it reaches 160 degrees), about 10 minutes. Remove from the heat, set aside and allow to cool for 3-4 minutes before whisking in the warm melted chocolate. Cover with plastic wrap and refrigerate for 20 minutes. In the bowl of a stand mixer or a large mixing bowl with a hand mixer, beat the butter until light and fluffy. Add the cooled chocolate egg mixture and beat until smooth. In a separate bowl, beat the heavy cream, cocoa powder, powdered sugar and vanilla extract on high until stiff peaks form. Fold the whipped cream into chocolate mixture and pour into the cooled pie crust (make sure it's completely cool). Using an offset spatula, smooth the top. 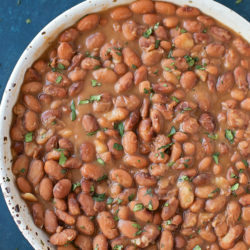 Place in the refrigerator to set for at least 2 hours. Before serving, prepare the topping. In the bowl of a stand mixer or a large mixing bowl, beat the heavy cream, powdered sugar and vanilla extract on high until stiff peaks form. Spread over the top of the chilled pie or pipe on. Sprinkle with chocolate shavings or curls, if desired. *I used two 4 oz. chocolate bars and microwaved them for 1 minute increments on half power, stirred and repeated until the chocolate was silky smooth. 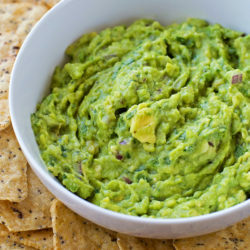 I’m partnering with Harmons Grocery, your neighborhood grocery store, to bring you today’s recipe. All opinions are my own. Thank you for helping me work with companies I love! 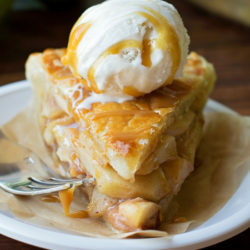 Can this pie be frozen for two days prior to being eaten once it’s made but before adding the whipped cream? I’m trying to say some time and would add the topping before serving. I love the swirly design you made on top with the whipped cream! So pretty! When you say semi sweet chocolate do you mean like chocolate chips? Or baking chocolate? Hi Rose, great question. I’m talking about baking chocolate. I usually buy it in 4oz. bars (Ghirardelli is my favorite). Hi there! when beating the butter in a stand up mixer before adding the egg and chocolate mixture, do you recommend using a paddle or whisk attachment? Can’t wait to try this!! thank you! Made this pie for Thanksgiving and put marshmallow frosting on it instead of whip cream and it was a hit! So delicious! Best chocolate pie I have ever made! Thank you for the recipe! Quick question, for the chocolate filling it says 1 unsalted butter but then in parenthesis it says 2 sticks. Is it correct to add 2 sticks of butter to the chocolate filling? Hi Sharon, thanks for catching that. It should have c. for cup after the 1 (or 2 sticks of butter). This is a very good recipe. The final result is extremely rich and the chocolate flavor is very strong; this is not an every day laid back type of dessert! This recipe does make use of some slightly more advanced technicques and it is a little time consuming to get from start to finish. 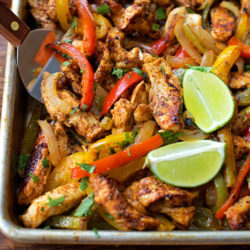 Probably more so for me since I doubles this recipe! But it was worth it in the end and was a hit at our Easter dessert table, Just as a tip I would recommend cutting this pie into at LEAST 10 pieces as this dessert is extremely rich as I said before! I wanted to thank you for sharing this recipe. I am a volunteer with hospice and I made a double batch for a meeting. I ended up with far too much filling because I was using store bought pie shells (Shhh). I placed the extra filing in miniature cheesecake pans and froze it. It was excellent that way also. The pies were a huge hit and were beautiful. They were for my coodinator’s 73rd birthday – she said they were the best she had ever had. You made my day! 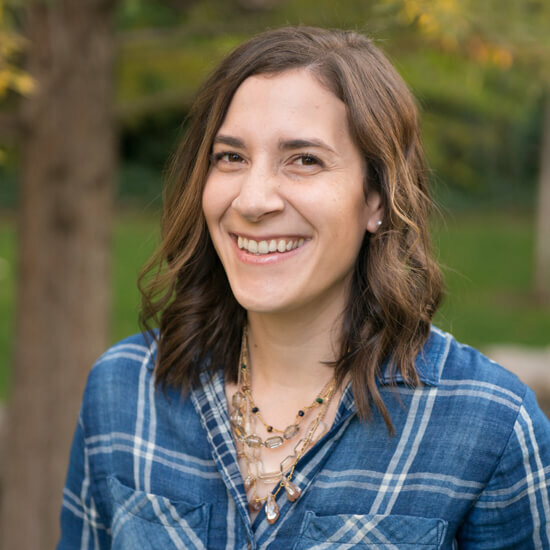 Thanks for sharing Deana!